3. A company is converting a cabled LAN to a wireless Ethernet LAN. What must be changed on every host on the network? Each host will require a new IP address. Each host will require an appropriate NIC or adapter. Each host will require that the operating system be upgraded. 4. What is the difference between a wireless NIC and an Ethernet NIC? The Ethernet NIC operates at 100 Mbps, whereas a wireless NIC operates at 10 Mbps. The Ethernet NIC uses a PCI expansion slot, and a wireless NIC cannot use an expansion slot. The wireless NIC uses CSMA/CA, whereas a Ethernet NIC uses token passing as an access method. The wireless NIC associates to an access point, and an Ethernet NIC attaches to a hub or switch using a cable. 6. 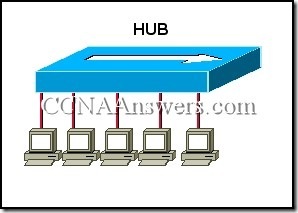 What type of cable is used to make an Ethernet connection between a host and a LAN switch? 7. Which wireless standard operates in the 5 GHZ transmission range and is capable of 54 Mbps of data throughput? Refer to the exhibit. What type of cable connects the two routers together without any intermediary device? 11. 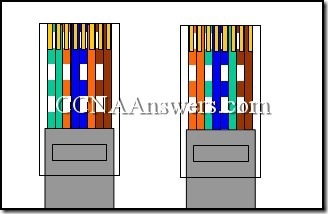 When is a straight-through cable used in a network? 14. Which Ethernet implementation requires the signal on the media to be boosted at a maximum distance of 100 meters? Refer to the exhibit. Which answer correctly identifies the pinout of the UTP cables labeled Cable A, Cable B, and Cable C?